The 2016 PokerStars and Monte-Carlo® Casino EPT Grand Final €25,750 High Roller was won by Alexandru Papazian from Romania, and he took home €1.197 million after defeating Alexandros Kolonias heads up. The third and final day of this event started with 12 hopefuls, including three-time World Poker Tour champion Anthony Zinno, 2015 November Niner Zvi Stern, and top UK pro Max Silver. The first player to get knocked out was Azerbaijani Ramin Hajiyev, who lost a coin flip with king-queen versus [Removed:2]'s tens. He was followed by Thomas Miller, who busted to Silver. With 10 players remaining there were seven double ups before Ivan Deyra busted on the final-table bubble. Deyra took home €103,570 for his 10th-place finish after running sixes into Silver's jacks. That allowed Silver to come into the final table with the chip lead, followed by Papazian, Stern and Kolonias. Stern's fellow countryman Saar Wilf busted in ninth place, as he ran ace-jack into Zinno's ace-queen. Wilf collected €122,250 for his efforts, while Zinno became a real contender after he also busted Imad Derwiche. Last season, Derwiche finished second in this event to Charlie Carrel, and this year he busted in eighth place for €147,710, with Zinno's ace-queen beating his pair of jacks after connecting with the river to give him a pair of aces. Although he came into the final table as the chip leader, Silver had an awful day. Since reaching the final nine, Silver didn't win any significant hands before losing a huge flip against Maksoud with tens versus ace-king. 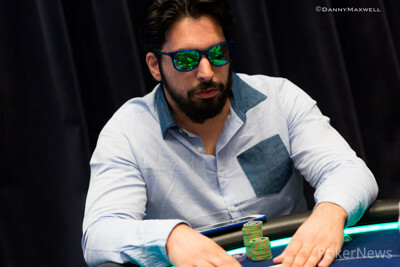 Maksoud took the lead, and Silver busted out two hands later to take home €202,050. Zinno's downfall started shortly after Silver had busted, and he exited in sixth place for €276,750. Zinno lost a big pot with ace-jack versus Rafael Da Silva Moraes' ace-ten before Kolonias finished him off. Maksoud, who held the lead for some time, busted in fifth for €364,500, after which it was Stern who took fourth. The Israeli player cashed for €460,700, which is his second biggest score behind finishing fifth in the 2015 WSOP Main Event. Stern ran ace-seven into Papazian's queens, and the Romanian player took a massive lead into three-handed play. Moraes was knocked out next, and he took €568,200 back to Brazil. Moraes flopped top pair, which turned out to be inferior to Papazian's better kicker. Papazian started the heads-up phase with 10 million of the 11.5 million chips in play, but almost immediately Kolonias doubled up twice in quick succession. After the dinner break, Kolonias doubled up once more, and that evened the match entirely. The heads-up match then went back and forth for hours before Papazian dealt the final blow. On the final hand, Papazian, who held a big chip lead, found ace-four to call Kolonias' shove. The Greek player held pocket nines, but they were cracked when an ace hit the river. That concludes the PokerNews live reporting from the Grand Final at the French Riviera, but make sure to tune back in regularly for the latest news and updates from events all over the world. Alexandros Kolonias moved all in for 1,620,000 and Alexandru Papazian made the call from the big blind. The board ran out and the ace on the river had Papazian's rail going crazy, as he locked up the single biggest score ever by a Romanian player. The stack of Alexandros Kolonias has been reduced to all but five big blinds. Alexandru Papazian limped in and Kolonias then shoved, giving Papazian a decision to make. The Romanian eventually called it off for just under five million chips and now he was at risk for the first time in heads up. The flop paired the ace for Papazian and he locked up the double on the turn, making the a formality. Papazian doubled for 4.93 million to leave Kolonias extremely short. Alexandru Papazian raised to 500,000 and Alexandros Kolonias called to see a flop of . Kolonias check-called a bet worth 4,000 before doing so again on the turn for 600,000. The action then slowed down and both players checked the river. Kolonias showed for nines and fours, which was good enough to scoop the pot. Two limped pots in a row saw Alexandru Papazian bet the flop and take it down right there. In the third one however, Papazian bet the flop for 200,000 and Alexandros Kolonias check-called. The turn and river were checked and Kolonias showed as winning hand. Shortly after, Kolonias min-raised to 400,000 and Papazian three-bet to 1 million. Kolonias called and did so again for 700,000 on the flop. On the turn, Papazian slowed down and checked, Kolonias took down the hand with a bet worth 1.3 million. Alexandru Papazian limped the button and Alexandros Kolonias checked his option. The flop brought out and Kolonias check-called 200,000. The turn brought the and Kolonias check-called another 800,000. The river brought the and both players checked after some deliberation. Kolonias showed and Papazian showed for the win. 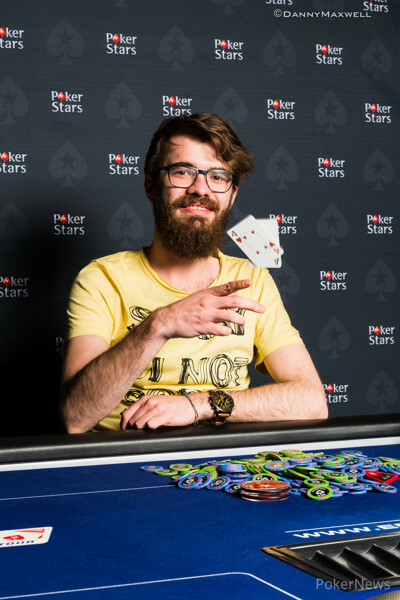 After a series of open-shoves and no calls as well as two walks, Alexandros Kolonias shoved for less than 14 big blinds and Alexandru Papazian asked the dealer for a count. The shove was for 2,710,000 and Papazian called. The flop changed nothing much, but the turn improved Kolonias. Any ace or queen would have ended the tournament right there, but the river was the ultimate blank and Kolonias doubled back into contention for the title. The flop showed when Alexandru Papazian bet 200,000 after Alexandro Kolonias checked to him. Kolonias called, and on the turn the hit. Kolonias check-called another 600,000 and the river was the . Kolonias checked for a third time, and Papazian fired out 1.3 million. After about a minute Kolonias folded, and once again Papazian extended his lead.